Sawn Veneer — Artisan Lumber Inc. There are several advantages to using sawn veneer over sliced veneer including workability, durability, and look and feel of the finished work. The diagram below illustrates the essential difference between sawn vs. sliced. To see some examples of sawn veneer in application please click here. Thickness range: 1/60" - 1/50"
Tools and skills required: specialized veneer tools and certain knowledge of how to properly adhere veneer to a prepared substrate. Preparation: logs are boiled before slicing causing a noticeable degradation of the material, homogenization of color, and a blurring of the grain pattern. Workability: Sliced veneer is frail, often brittle, and requires handling with extreme care through the working process. Thickness range: 1/16" - 1/8"
Tools and skills required: standard woodworking tools and supplies and knowledge of principles of woodworking. Preparation: sawn veneer billets are derived from air-dried flitch sets that are kept in sequential order. Grain patterns remain distinct, colors rich, and the lignen in the wood is largely preserved resulting in superior workability. The billets are face and side jointed and then the veneers are cut and ordered. Workability: at these tolerances our veneer is still wood and handles as such. It can be hand or machine planed and sanded through the various grits. 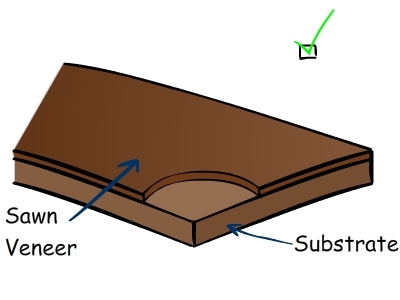 The requirements for surface preparation are more forgiving than sliced veneer.